For a fume cupboard to perform satisfactorily it must be connected to an appropriate ventilation system which extract fumes efficiently from the fume cupboard and discharges them outside the building in such a manner that they are adequately dispersed and do not re-enter the buildings or otherwise present a potential hazard or nuisance. The air extracted through a fume cupboard is far greater than the normal extract rate of a room or laboratory and to prevent excessive build up of negative pressure within the laboratory which often reduces the performance of the fume cupboard then a balanced make up air system should be introduced. This should be designed in such a way that the make-up air introduced into the laboratory should not interfere with the air movement and patterns around the fume cupboard and should still maintain a small negative pressure within the laboratory. 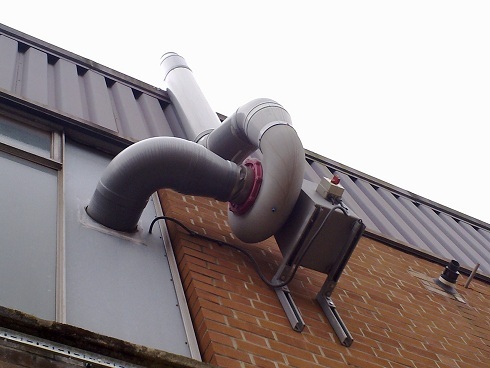 Holliday Fielding Hocking has many years experience in designing and specifying fume extraction and make up air systems and would be happy to discuss your requirements.